Experience the contrast of the region’s oldest railway and the world’s most beautiful Cableway, knowing that we have taken care of all the details with our Kuranda Boarding Pass. Tjapukai is our first stop this morning and includes lunch. Then board Skyrail Rainforest Cableway for your journey over and through World Heritage protected rainforest, before some free time in Kuranda. Avoid the ticketing lines before boarding the famous Kuranda Scenic Rail, our Kuranda Boarding Pass ensures you will have preferential seating. 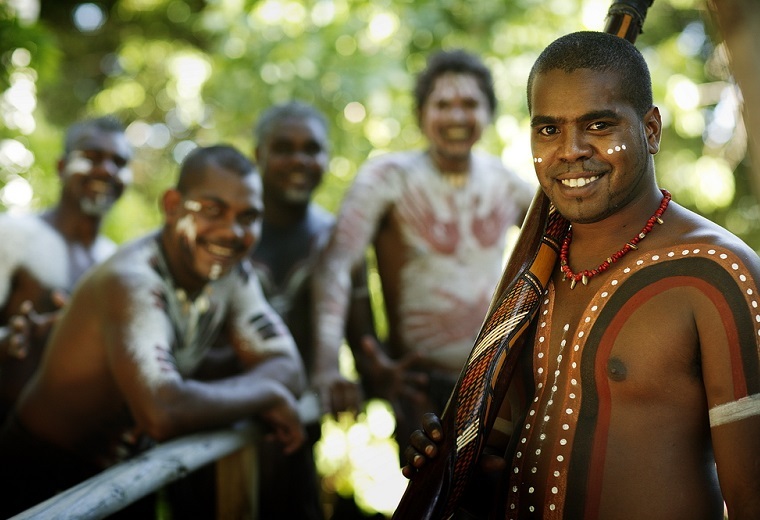 Your tour today offers the wonders of the rainforest, as well as our unique indigenous culture. Enjoy the many attractions of this fascinating park. Glide over and through the World Heritage rainforest with Skyrail Rainforest Cableway, before free time in Kuranda. Use your Kuranda Boarding Pass to gain discounted entry to selected Kuranda attractions. 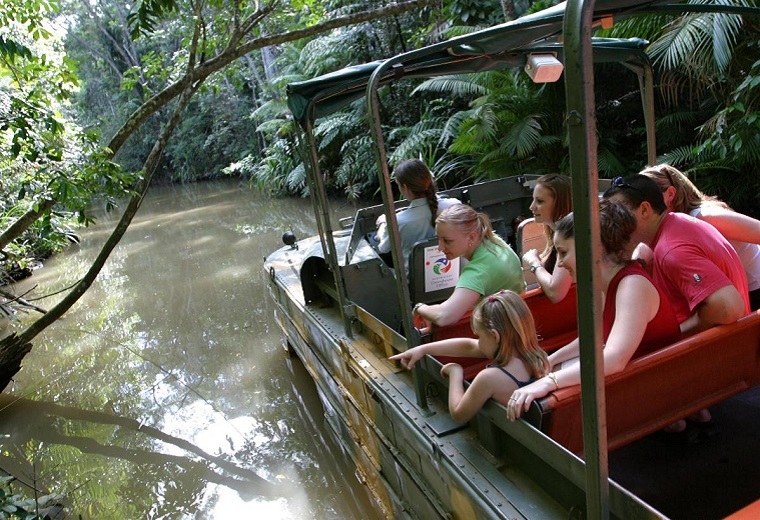 Travelling with Down Under Tours ensures preferential seating on the Kuranda Scenic Railway. This spectacular journey offers wonderful views as you wind your way to Kuranda, over bridges & through tunnels. 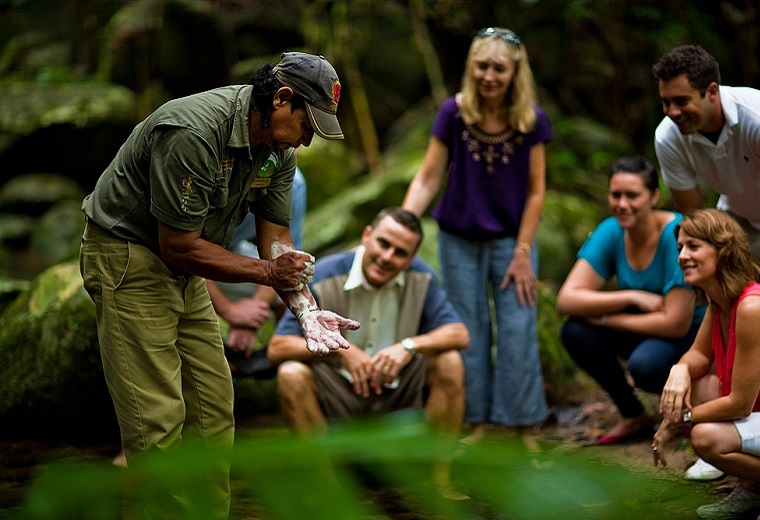 A unique experience awaits today … Join the Dreamtime Gorge Walk at Mossman Gorge, learning of dreamtime legends, bush tucker sources and traditional plant use before tea, damper & question time with your Indigenous guide. Also included is a delicious lunch at The Daintree Teahouse and an informative cruise on the Daintree River. Travel in air-conditioned comfort in your luxury purpose-built vehicle to Cape Tribulation; through some of the oldest rainforest in the world … Included is morning tea and a driver guided walk at Mossman Gorge, a cruise on the Daintree River, delicious tropical BBQ lunch set amongst the rainforest, and a walk on famous Cape Tribulation Beach. Included also is a delicious exotic fruit ice cream cup at the Daintree Ice Cream Company and a photo stop at Alexandra Lookout, before returning home. 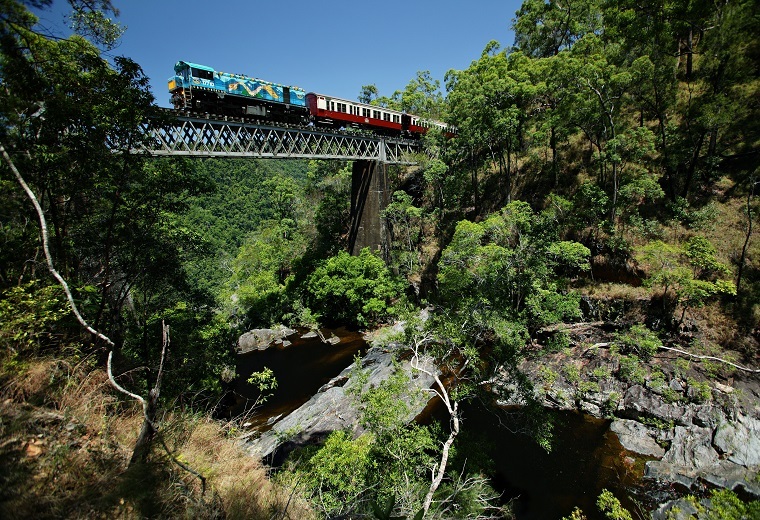 A wonderful day awaits as you are transported on the historic Kuranda Scenic Rail to Kuranda. Rainforestation, set in 40 hectares of lush gardens, is your next stop. Board the amphibious Army Duck and also enjoy the Wildlife Park. Transfer back to Kuranda, then it’s time to board Skyrail Rainforest Cableway for your return journey. A wonderful day awaits as you are transported on the historic Kuranda Scenic Rail to Kuranda. Rainforestation, set in 40 hectares of lush gardens, is your next stop. Board the amphibious Army Duck, see unique tropical fruits, ancient rainforest plants & native animals, before a performance by the Pamagirri Dancers. A BBQ lunch is included as well, then it’s time to board Skyrail Rainforest Cableway for your return journey. We make it easy for you to experience the authentic heritage of the world’s oldest living culture with a visit to Tjapukai. After enjoying Aboriginal cuisine, you’ll soar over enchanting greenery on the Skyrail Rainforest Cableway to reach the charming village of Kuranda. There you can explore the Heritage Markets or wander among beautiful fluttering wings in the Australian Butterfly Sanctuary, before taking a preferred seat on the Kuranda Scenic Rail. Gaze out the windows of the Scenic Rail at the majestic World Heritage rainforest, as the train winds through tunnels and coasts over bridges. 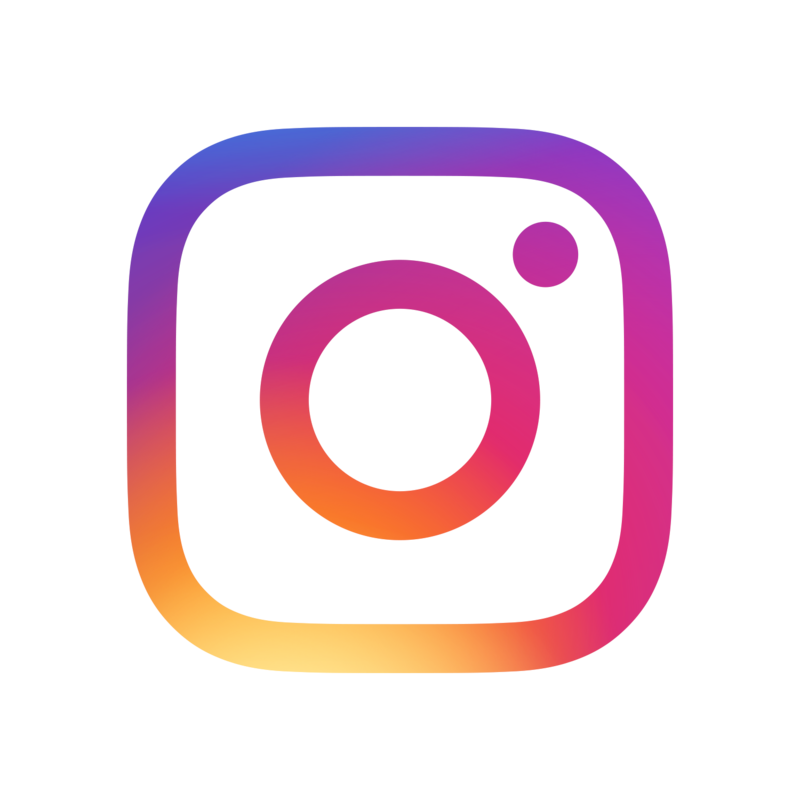 You’ll be entertained by Kuranda’s attractions, such as the gardens of Rainforestation, the iconic koalas at Wildlife Park, and the one-of-a-kind Army Duck. A haunting performance by the Pamagirri dancers, set against the natural backdrop of a rainforest amphitheatre, offers unique entertainment. Be intrigued by the Dreamtime Gorge Walk at Mossman Gorge, as you absorb the legends shared by your Indigenous guide and sip tea brewed from local plants. 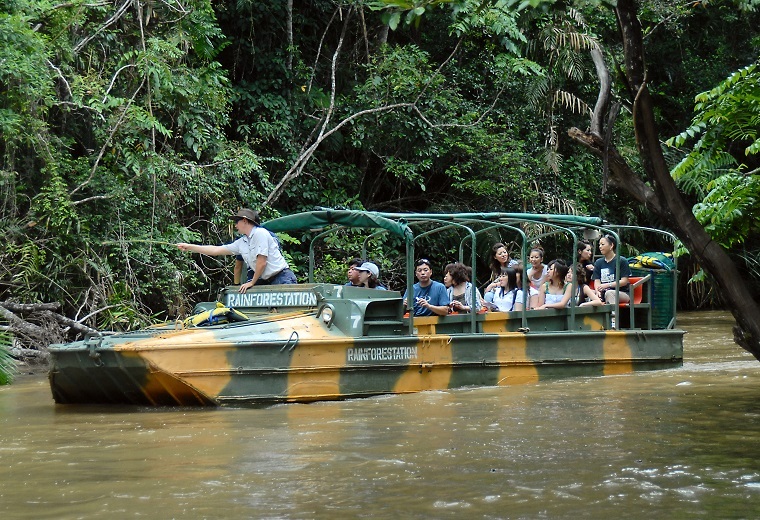 Tour the lush lands on foot, and then sit back and relax with a cruise on the lovely Daintree River and a mouthwatering meal at the Daintree Teahouse. We’ll also treat you to a historical tour of Port Douglas. 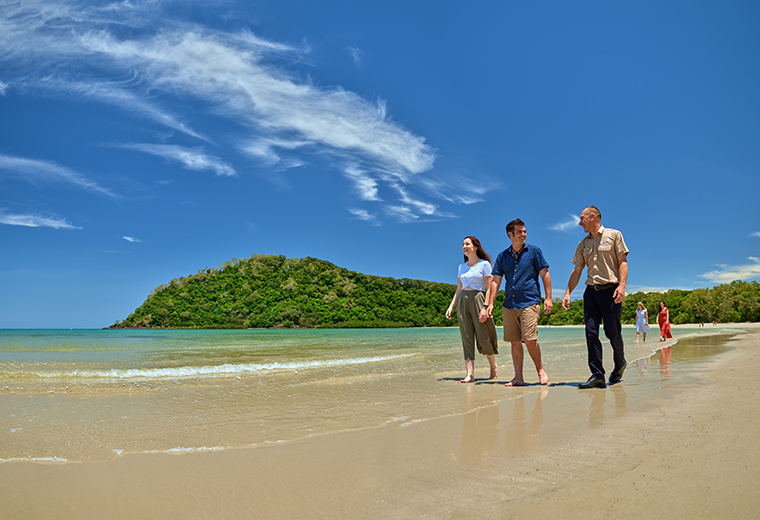 Travel in comfort to Cape Tribulation in our customized, air-conditioned vehicle, where you can stroll along the white sands and azure waters of Cape Tribulation Beach – the gem of all rainforest beaches – to enjoy magnificent views of Daintree Coast. We’ll make a stop at Mossman Gorge Centre for tea and an informative guided tour. 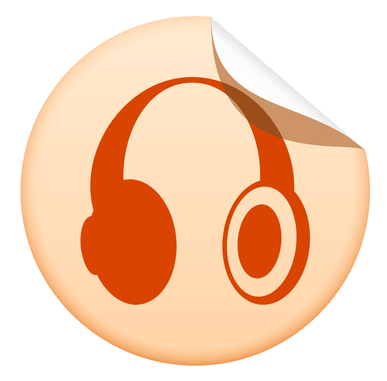 Down Under Tours is your source for touring all the cultural, scenic, and historic attractions of Indigenous Australia.